Is it actually spring yet? I know that I am totally early for declaring Spring here, seeing as we normally see a snow fall in April in Canada, but I cannot help but cling to the songs of the birds, and the brighter sun, and longer days and embrace everything that comes with the softness and newness of spring. So what is new here? What can you expect from me in the next little while? First let me share some great news with you. Laura Fedorowicz is now a full fledged profitable business for me and my little family. We recently went ahead and made things totally official, and Incorporated. Our full business operating name is Laura Fedorowicz Creative Inc. There are lots of big plans for this business as we go along here, obviously sticking to what we know best- which is light + bright art, and art design to beautify every day accessories. We will be expanding our product offerings through third party websites, so you will continue to see fresh new designs through Deny Designs, Casetify, Society 6 etc. I have a rumbling of interest in learning/experimenting with pattern making, and more digital art offerings, so I will be dipping my toe in the water here, and taking some online courses in this area. There is nothing I love more than trying to tackle something new. Another big goal is to GO BIG. For a long time now, I have been sticking to small scale art. This has worked for me and my business in so many ways. Working small has allowed me to honour my body and my need for rest and comfort during this Lyme treatment period. It is easier for storage in the studio, and obviously easier for shipping. I have heard you asking for bigger art offerings, and I am going to deliver. This will apply to print offerings as well, but also ORIGINAL art. I will be taking a leap of faith and creating larger canvas’ and originals on paper, and I am so grateful to have received your feedback on this, and for your patience as I stayed small for this time period. Do you feel like you would like to be a part of this business? Do you love the artwork you see here? 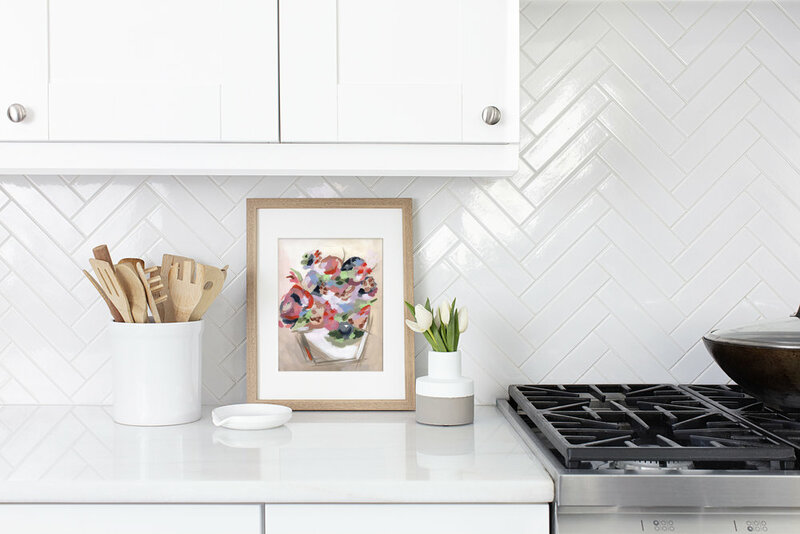 I have opened up an ambassador program in which, you will be able to pick and receive Laura Fedorowicz Prints (before they become available to anyone else) throughout the year, no cost to you, in exchange for providing us with light + bright images of this artwork in your spaces. You can style it in anyway that is suits your space, and we will use these images on our social media. This is an opportunity to share your skills, get free artwork (how easy will it be to update your decor during the changing of the seasons) and get some traffic to your own social media channels as you will be tagged in our posts. If you are interested in applying please email us at hello@laurafedorowicz.com with why you would be a good fit for this program, links to your own social media, and a blurb about why you think you are a good fit for everything this brand stands for. We cannot wait to work with you! I have some fun and exciting collaborations coming through the pipeline this Spring and Summer and I cannot wait to share these with you as they become available. Any collaborations that I enter into will continue with the empowerment, health, beauty and self love personal values that are SO near and dear to me. I will be blogging more about my journey with overall health and Lyme treatment. It is becoming more and more important for me to share my journey with others, and I truly feel like I am blessed with this Chronic Illness as it has pushed me to the edge and brought me a whole new perspective and sense of being. I will be separating these health posts from my normal art blog posts so that you can read them if you so choose- or you can stick to just following the art updates. I want to take a moment to thank all of you for traveling along this journey with me. Whether you have been here for a while, or are just joining me- I am grateful. Whether you like my instagram posts, or whether you invest in me by purchasing from me directly or through my third party vendors I want you to know that by doing so YOU are making a HUGE impact on the my life, but more importantly on my family. Becoming a profitable business means I can provide fun activities and programs for my girls, I can afford my massive supplement and Lyme treatment bills…you get the picture. Each purchase, or share, or like, makes a big difference in our lives. If you are just starting out in your own creative business, I want to offer some encouragement. When I first started sharing my art on instagram - I had no idea how to use instagram. I didn’t even use hashtags I just wanted to share my art. Start small, make goals, and most importantly keep at it. You never know which piece of work will garner you a jump into the profitable side of the art business. Be true to yourself, and keep your head held high. Do the work, and believe in yourself. How is it approaching the end of November already? My mind is spinning with the fact that the countdown to Christmas, and year end is already upon us. This is the time when lots of us look back and reflect, and make plans for the next year. 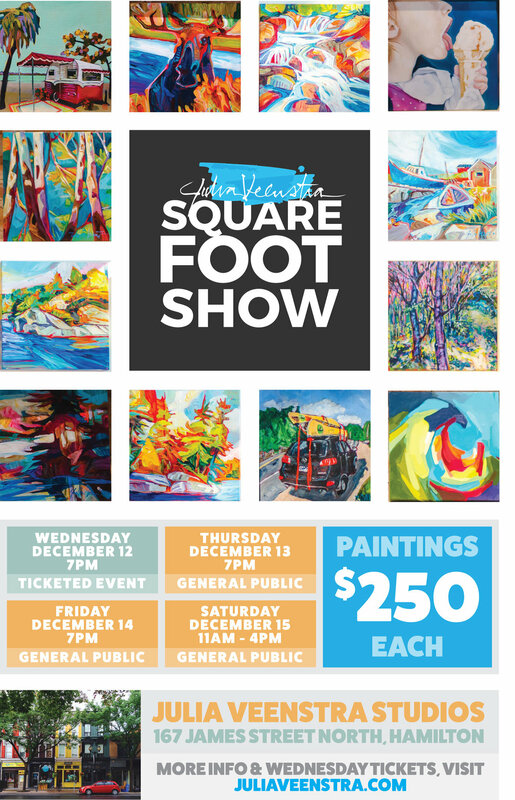 While I have been doing all that, taking lots of fun courses on skillshare- I have also been working excitedly on 5 new pieces of work to display at Julia Veenstra’s Annual Square Foot Show. Julia is an local artist whom I admire greatly, and this show is held at her studio in Hamilton. (167 James Street North) On 11.11 I was doing lot’s of reflecting and anticipating the New Year, when this opportunity quite literally came to me. Of course, I jumped at it. A sneak peek at the tones for this mini collection. The 5 pieces will be delivered to the Studio this Saturday and I am absolutely in love with each and every one of the 5 I have chosen. I always work on more pieces that I will end up needing so that I can literally choose the ones that are speaking to me the most- to ensure the collection is full of works that I have a strong connection to, and works that compliment each other. The ones that I do not enter into the show, will be be sold here on my website. The Square Foot Show is just as it sounds. Julia has hand picked artists to be a part of the show, and each artist is to enter 12” x 12” canvas pieces. Each canvas will sell for $250.00. This is phenomenal deal and a chance for people to get really amazing art at a lower, and more affordable price- just in time for the holidays! The show begins on December 12, for a ticketed event (which is ALREADY sold out- it sold out the day she posted the tickets in fact!) However, the show also runs through to the 15th so if you are local you will have plenty of time to stop by and see these works in person. I will be aiming to be there on the Thursday Night, and if anything changes I will update you here, and on social media. I would love to see anyone in person that is able to come- and meet some of you lovely supporters, of whom I am so thankful for. On a side note, regarding Black Friday/Shop Small weekend discounts- I have decided with the Canada Post Strike to not offer any big sales at this time. I had everything ready to offer hefty discounts on my shop- but after thinking it over I have decided to postpone this sale. I want to save everyone the hassle of shipping. (Canada Post has said there looks to be no end in sight for the strike, and that people should stop sending packages to Canada- and vice versa. They have such a long backlog.) I also want to say- I am not saying anything negative regarding Canada Post workers, they have every right to strike and fight for their livelihood. But, shipping rates from other reliable shipping companies will defeat the purpose of me having a sale price on my work. If and when the strike is over- I will offer the same discount that I was planning on offering. If there is something that you want, or must have from the shop before the holidays, please email me at hello@laurafedorowicz.com and we can arrange different ways of shipping- and I can quote you for another carrier. All that said- Thank you again for coming along on my vibrant art journey- I am grateful for each and every single one of you!